Solar power is energy from the sun. It is becoming a serious source of energy, through solar panels, photovoltaic cells and parabolic reflectors. The power of the sun can be used to heat water. 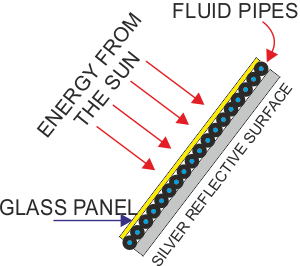 A typical solar panel for heating water, is a combination of magnifying lenses and fluid filled pipes. The fluid in the pipes is warmed by the sun. In turn the fluid filled pipes heat up a tank of water. Hot water is the result. 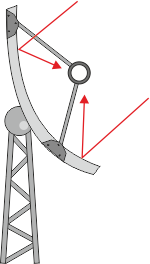 Large numbers of parabolic mirrors can be used to focus the power of the sun, heating a solution of potassium nitrate and sodium nitrate, in a series of pipes, which in turn converts water to steam. The steam drives turbines producing electricity. A Solar Electric Power Generation Plant in Andalucia (Spain), has the capacity to produce 50 MW of electricity, using parabolic mirrors that track the sun. Silicon is a ‘semiconductor’ that conducts electricity efficiently. It is the main material of photovoltaic cells. The phone box seen opposite is powered directly by photovoltaic cells during the day. Batteries are charged during sunlight hours, for use at night. Many houses have photovoltaic cells on the roof, producing electricity for the National Grid. 2. Name one more example of renewable energy.